As schools struggle to get their heads around the proficiency expectations laid out in the Common Core and other newly revised state standards, perhaps nobody will struggle more than educators working with English language learners (ELLs). After all, ELLs have to build their content knowledge and their language skills simultaneously. On top of that, as it says in a report by nonprofit education consultancy WestEd, "Often, especially if they are recent immigrants, they also have to learn about and adapt to the culture of U.S. schools." Helping these students is a large and growing issue. The National Center for Education Statistics estimated that in 2011-2012 more than 9 percent of public school students — 4.4 million — were English language learners. In eight western states, 10 percent of public school students were classified as ELLs; in California, the figure was 23 percent. According to the National Clearinghouse for English Language Acquisition, nearly 80 percent of ELLs are in Spanish-speaking homes. Yet even then, ELLs don't make up a uniform group. As a report by the National Council of Teachers of English laid out in a 2008 policy brief, "ELLs are a highly heterogeneous and complex group of students, with diverse gifts, educational needs, backgrounds, languages and goals." That diversity complicates the process of planning how to each them. One way that teachers can optimize their time with their ELLs is through the use of technology. These eight free (and nearly free) digital and online resources encourage students to improve their English by putting them in control of their own learning. 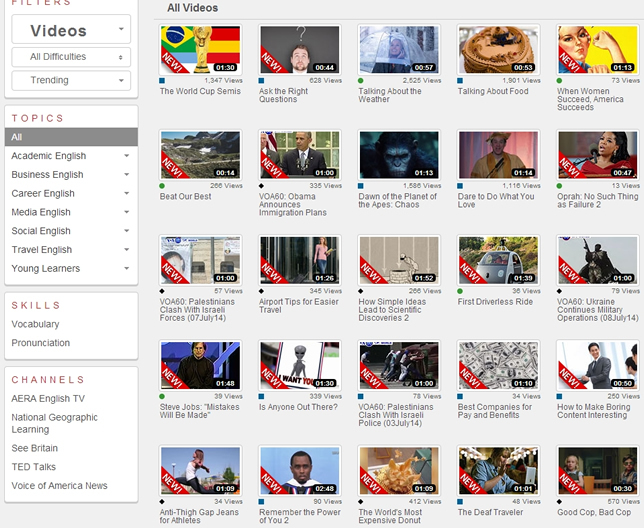 This site promises to "improve your English online" by offering 8,000 videos on a multitude of timely topics. With paid premium editions, students read transcripts, and the system monitors pronunciation progress with proprietary "intellispeech" technology. The site, which adds dozens of new videos each week, also helps users build their vocabulary by giving them multiple-choice quizzes on word definitions. The program tracks scores and provides a leaderboard to exhort students to continue playing. "It's clearly my students' favorite site," said teacher, book author and blogger Larry Ferlazzo, who resides online at Larry Ferlazzo's Web Sites of the Day...for Teaching ELL, ESL and EFL. "It has engaging videos that reinforce reading, listening and speaking skills. Its software does an impressive job of evaluating how well students are correctly repeating words and gives immediate feedback." For $55 a year, teacher subscribers gain access to libraries of lesson plans and flashcards for teenage English learners. The site promises English, Spanish and French editions of 500-plus lessons and 2,000 flashcard images that can be printed and copied to pass out in class. Lessons are categorized by general purpose such as, "discussion starters," "mini debates" and "famous people, and a blog directs users to new additions. This company sells 11 low-cost apps designed to help students with special needs, but the apps are also gaining interest from ELL teachers who want to exploit the visual and audio capabilities of Apple's iPhone and iPad. For example, Language Builder uses audio clips and a recording feature to help students improve sentence creation, formation and expression. One reviewer reported, "This is a great tool to get students talking." 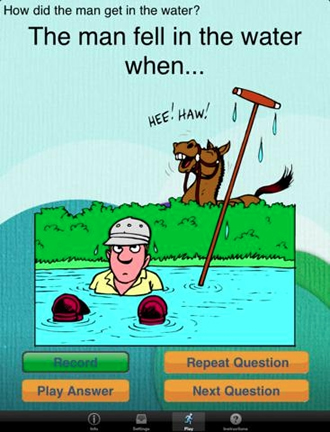 Another app, StoryBuilder, is intended to help learners improve paragraph formation and integration of ideas by showing pictures and asking questions to get responses from students. Those responses are recorded and then compiled into a story that can be e-mailed to a teacher or family member. Yes, this blog promotes Pearson products, but even more often it features advice and ideas from instructors who work with Pearson but also teach in the classroom. For example, a recent post shared five ideas for using student-generated content in digital form, such as video captured by a student's phone. Other posts have explored the flipped classroom, lessons for specific holidays and new ELL-related research. This site includes a thousand animated and interactive games, exercises and presentations to help young English language learners to read. Users must register in order to take advantage of the site's personal scoring system and to access the resources. Don't concern yourself too much with the British spellings; the site was created by a Brit living in Israel and a co-developer in France; both have decades of experience in working with children and adults who are learning English. Supporting English Language Learners Under New Standards is an eight-week massive open online course (MOOC) designed to help teachers support ELLs in meeting Common Core standards. Although the Oregon Department of Education is promoting the course for its own K-12 teachers, it's open to anybody for free. Oregon is a member of English Language Proficiency Assessment for the 21st Century (ELPA21), one of the consortia working on assessments for English learners that align with the Common Core. One of the MOOC instructors is Kenji Hakuta, the Stanford professor responsible for the "Understanding Languages" site. Other instructors include Karen Thompson, an assistant professor at Oregon State University, and Sara Rutherford-Quach, a Stanford lecturer. The course starts on October 1, 2014, ends on November 24 and is expected to take about 30 hours to finish. Participants will work in teams (which can include people you know or strangers who work in similar geographic areas or grade levels). Be forewarned: If you're not a teacher, you may feel left out when the instructors ask you to submit student language samples and implement lessons in the classroom. Developed as a joint project by the United States Department of Education; the California Department of Education; the Office of Career, Technical and Adult Education; and the Division of Adult Education and Literacy, this free site is intended to support immigrants who want to learn or improve their English skills. While it may draw adult learners, everything here will work for high school students too. Features for those who register include topical videos; a picture dictionary; multimedia activities with video, images and audio; vocabulary practice for 800 words; quizzes with automated scoring; and tracking of student activity. U.S.A. Learns apps are available for iOS and Android devices. The Stanford Graduate School of Education is developing teaching resources for English Language Arts, mathematics and science. Although the collection will grow, existing units are ready-packaged with teacher guidelines, printable student handouts, occasional videos and other insights for helping educators support their ELL students. Hosted by World-Class Instructional Design and Assessment (WIDA), one of two consortia developing versions of the Common Core assessments for ELLs, this site allows educators to upload and share lesson plans specifically addressing English language development and content-area standards. At the time of this writing, the site contained about 31 lesson plans; but as the WIDA assessment percolates throughout the states that are part of the consortium, that's sure to grow. 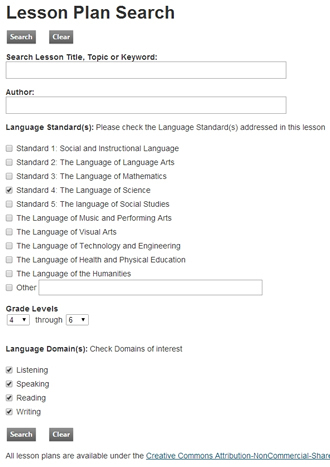 To search for a lesson plan, users can select a language standard, grade level, language domain (listening, speaking, reading and writing) and a keyword. While you're at WIDA, check out the Download Library, which is packed with standards, research and sample assessment items.